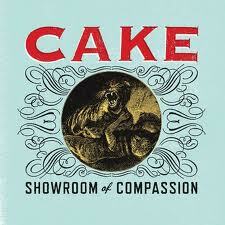 Late-nineties indie stalwart Cake has its own particular way of doing things. One is adding a trumpet — just one, mind you — to almost every song. Another is for frontman John McCrea to only sort of sing the band’s tunes, in somewhat of a quasi-melodic spoken-word fashion. Another curiosity about the band, apparently, is that if they don’t have anything to release, they don’t release anything. I can only assume this is the thinking behind the seven year gap between Cake’s last album, Pressure Chief, and January’s Showroom of Compassion. To anyone’s knowledge, the band didn’t break up by any means. They still toured, although very sparsely. They just sort of…disappeared for a little while. They also, in those few off years, renovated their personal recording studio in Sacramento to be completely removed from the city’s power grid and rely only by solar energy. In light of this, it should probably be noted that Showroom of Compassion — in type of metaphor for Cake’s new studio — is likewise not using any new power, but rather tapping into that sunny source from where the band’s music has always come. Those hoping (though I can’t understand why one would) that the band would return after an absence this long with a completely new sound will be disappointed. This is — as it almost literally were, since you could technically have sired a seven-year old to listen to this album with you since the last time you listened to a new album from them — your father’s Cake. And that’s not such a terrible thing at all. The aforementioned ingredients are all still there: that lone trumpet, McCrea’s dry wit, the under-instrumentalization which endeared them to fans in the early nineties. And, by all accounts, their frame of mind seems to have returned intact as well — they didn’t show back up with some sort of wacky new-age sensibility or trippy, eccentric idea on how the world should work (the winking “Federal Funding” and the worried brow of “Teenage Pregnancy” contain the album’s only trace elements of commentary). Cake has always been a warm, sunny band, which is perhaps why it’s only fitting that Showroom of Compassion is fueled entirely by solar energy. It’s nice to have them back, nice to see they haven’t changed too much in that time away, and nice to have their distinct sound again. Showroom of Compassion probably isn’t going to blow your mind, but you may just want to give it a big hug. And sometimes that’s just as much of a ringing endorsement.